For any individual that wishes to rent a party bus in Lansing, MI, then you can stop your search immediately. Here at Rockstarz Limousine and Party Bus, we have the experience that you are seeking that will ultimately result in you and your guests having an amazing time from start to finish. This will be a party that nobody will ever forget. 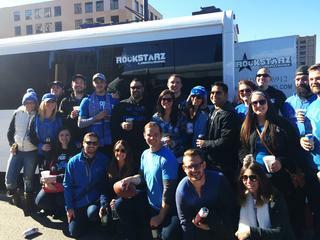 Our Lansing party bus rental options are specifically designed to provide you with something that is going to ultimately be memorable. The layout of the bus is such that it will allow you to invite even more people to party with you, and there are also a number of luxurious leather seats to just give people the chance to rest while the party carries on in front of them. We also understand how anybody that is searching for a Lansing party bus rental will want a special kind of atmosphere to really add to that party feeling. In our instance, we have installed a top of the range stereo system that allows you to fully enjoy the music, and there is also a spectacular laser light show that will just make you and your guests feel as if you are in an amazing nightclub. People have previously looked to rent a party bus for a whole host of celebrations and we can cater to your every need no matter what they may be. Perhaps you are looking at a certain birthday coming up, or some other anniversary. Maybe you are planning on getting married soon and want your bachelor or bachelorette party. Whatever it may be, we can help. At Rockstarz Limousine and Party Bus, we excel at giving our clients the best experience possible, so if you live in the Lansing area, then give us a call today. Alternatively, you can contact us via our website and a member of our team will be in touch as soon as possible in order to discuss your requirements.